POC Albuquerque: Michael Barger. POC Three Rivers: Douglas Smith. POC Gadsden: Bob Northrup. Duties: Coordinates educational outreach programs to educate the concepts of patriotism and the "Basic Documents". Coordinates patriotic holiday ceremonies. POC Albuquerque: John Farris, Dan Sheehan. POC Three Rivers: Cecil Scales. POC Gadsden: Bob Northrup. POC Santa Fe: Jim Thornton. Duties: Reviews and makes recommendation for change as needed. Duties: Develops and promotes uniformed color guards. Coordinates events. POC Three Rivers: Kris Jones. POC Gadsden: Bob Northrup. POC Albuquerque: Michael Barger. Duties: Coordinates list of Eagle Scouts. Obtains certificates and medals to present. Oversees the judging of the Arthur M. & Berdena King Eagle Scout Scholarship program. POC Three Rivers: Kris Jones. POC Gadsden: Capt. Walter Baker. POC Albuquerque: Harold Jacobs. Duties: Recommends Medals and Awards for members of other persons. Obtains the certificates and medals for the presentations. POC Albuquerque: George Garcia, John Farris, Robert B. Rodriguez. POC Three Rivers: Douglas Smith. POC Gadsden: Phillip Bishop. Duties: Recommends a slate of officers to be placed on the ballot. Plaques Committee – Chairman: Ralph Barker. POC Albuquerque: Ralph Barker. POC Three Rivers: Lee Wooderson. POC Gadsden: William Baker. POC Santa Fe: Jim Thornton. 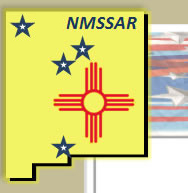 Duties: Determine sites and criterion for awarding Plaques to sites around New Mexico (1+ per year goal). ROTC/JROTC Committee – Chairman: Andrew Lynger, Jr.
POC Gadsden: Andrew Lyngar, Bob Northrup. POC Three Rivers: Kris Jones. POC Santa Fe: Jim Thornton. Duties: Coordinates list of ROTC Cadets. Obtains certificates and medals to present to deserving Cadets. Help is needed on all of these committees. If you would like to be involved in any of the committee activities, please let your chapter officers know.